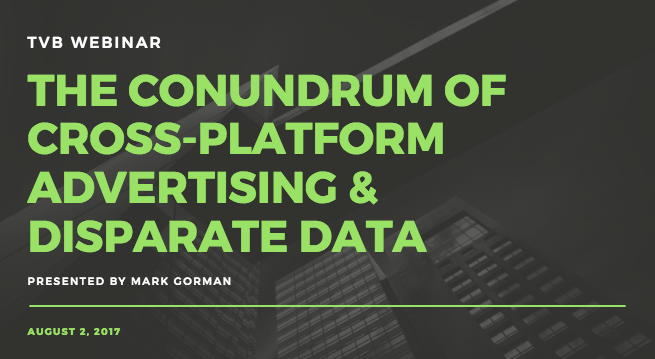 Next week, Matrix Solutions’ CEO Mark Gorman will speak to the radical shift in how broadcasters sell media ads in an exclusive TVB Webinar entitled, The Conundrum of Cross-Platform Advertising & Disparate Data. Now tasked with selling an assortment of ads, the broadcast media ad sales teams need sophisticated tools that organize their data and highlight opportunities. They must know what inventory is available to sell and which audiences are available for the brand advertiser to reach. Add to the equation the rise of integrated campaigns that utilize multiple platforms and the power of frequency and reach to garner successful results. The skill set once required for media ad sellers has evolved. Combining analytics with technology built to the unique needs of broadcast sales teams is a necessity. Mark will discuss the challenges sales teams face and divulge where inefficiencies lie when it comes to collecting and managing disparate data sources throughout one’s media enterprise. Additionally, Mark will highlight how technology can align resources, data, and intelligence to help broadcasters build more consultative sales teams. Better understand the tools you need to build a consultative sales team. What kind of business intelligence is needed to make smarter decisions. How to use technology to manage / streamline the sales workflow for a more efficient sales process. If you're a TVB Member, click here to register for the webinar happening August 2, 2017 from 1pm – 2pm EST.